devoted to promotion of diverse aspects of tropical biodiversity and published twice a year. CAB Abstract and database, U.K.
regulation of water cycle and stabilization of climate. The diverse genetic pool, collectively called as biodiversity, possesses immense potential for selection and transfer of desired traits across the organisms, which is lifeline of modern industries based on biotechnology and tree/crop protection and improvement. Thus, the improvement in quality of human life particularly tribal/ rural folks directly relates to the promotion of biodiversity, which is otherwise, a sustainable resource of raw material for various traditional industries, such as paper and pulp, medicine, cosmetics, etc. However, the benefits cited above also contribute to continuous depletion of tropical biodiversity, extinction of several kinds of plants and animals and ecological imbalance, making the mother earth inhospitable for sustenance of life. This necessitates to promoting tropical biodiversity by understanding its genesis with respect to climatic change, technology development for rehabilitation of difficult sites, productivity enhancement and population expansion of endangered / threatened species. 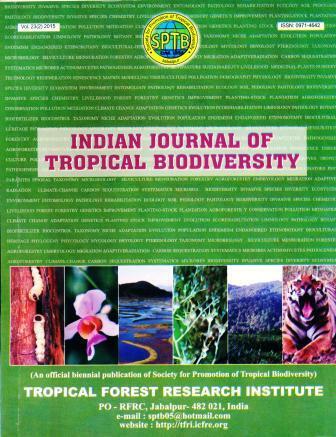 To realize above goals, Society for Promotion of Tropical Biodiversity has been constituted to adopt and orient Indian Journal of Tropical Biodiversity as its official mouthpiece. Consequently, the journal has now widened its horizon, publishing contributions dealing with multiple facets of inter-disciplinary researches of physical and biological sciences devoted to resolve prevalent crisis of the tropical biodiversity. It also intends to disseminate research information to a broad audience of scientists, educators, policy makers, conservationists, naturalists and the general public for deeper understanding of species, ecosystems and inter connectedness of living world. The Indian Journal of Tropical Biodiversity successfully completes two decade of its existence and enters a new era of consolidation. In consonance, the print quality and size of the journal has been enlarged to pack more information and match with the international format of journals.